I finished final exams for my third term of nursing school on Thursday and I couldn’t be more happier! This means that I’m officially halfway through the program! I’m that much closer to becoming a registered nurse and I’m still excited about my future career – this is how I know that I made the right decision with this program/profession/career choice. It was this or actually, you know, using my first degree. But then I’d be working in a lab or something for the rest of my life, and that’d just make me sad. But you guys – I’m that much closer to becoming an RN. This is the dream. Next term, I’ll be on a medical or surgical ward. Then I’ll be in community or public health in August-December. And then come January 2015? My last term of nursing school. I get to have a say in what kind of ward(s) I’ll be on and, even better, I get paid to do it. Real money! Income! My income may be higher than my expenses for the first time since my first university experience! This is awesome! I’m likely to request my preceptorships to be in: surgical (post-operative), emergency or… pediatrics. I fell in love with pediatrics during my rotation. Sick babies, toddlers, young kids, teenagers. It’s such a different feeling and I loved it. But I only get two different preceptorship spots, so I’m likely going to choose surgical and emergency. This is because pediatrics is a specialty (more so than the others, although emergency/trauma is one too…) and I’d lose some of the skills that I could develop early on in a medical or surgical ward. 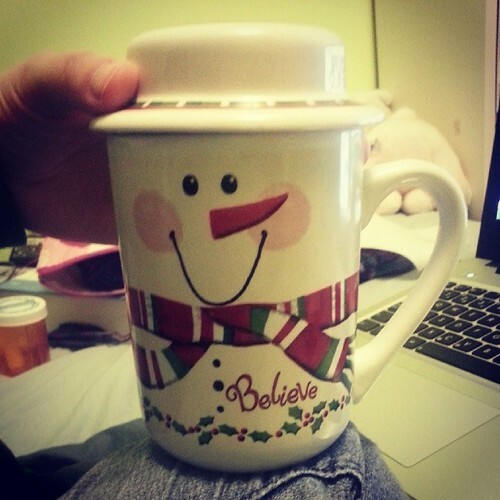 Why yes, my snowman mug that wants you to believe in the magic of Christmas does have a hat for a cover! It’s the most awesome thing ever. I only use it in the month of December. You know, to preserve the magic of the holidays. And because it holds a decent amount of hot chocolate. My plans for the holidays include a lot of baking (shortbread, sugar cookies – iced and uniced, (cup)cakes, and possibly a pie or two. I love holiday baking! As well as some reading (for fun), knitting and crocheting (holiday gifts) and possibly making some more jewellery. I actually made quite a bit during the term (21 pairs of earrings and 1 bracelet), so I may not. But my holiday plans do not include going shopping for presents as I already finished that. Back in November. Last year I didn’t do any present shopping until I was done finals and it was just awful. This year I learned from that mistake and got it done early. Hopefully I’ll be better at blogging during my break, fingers crossed! Yay! Congratulations on finishing finals! That’s really exciting especially since you’re getting closer to being a licensed nurse! I’m really excited for you. I absolutely love that mug by the way. I’ve had hot chocolate almost every single day for the past three weeks (I’m praying so hard I don’t get diabetes or something) but I love chai too. It’s good especially during these super cold months. I am so happy for you! It must feel so good to be that much closer to being done! Congrats! That is so exciting that you are halfway done. I’m so glad that you feel like you are in the right career pathway. It definitely makes the hugest difference when you feel like you are happy and enthusiastic about what you want to do. Merry Christmas!